I plan on making a longer post about this later in conjunction with my planned photo essay, so… know that I will be repeating it later. 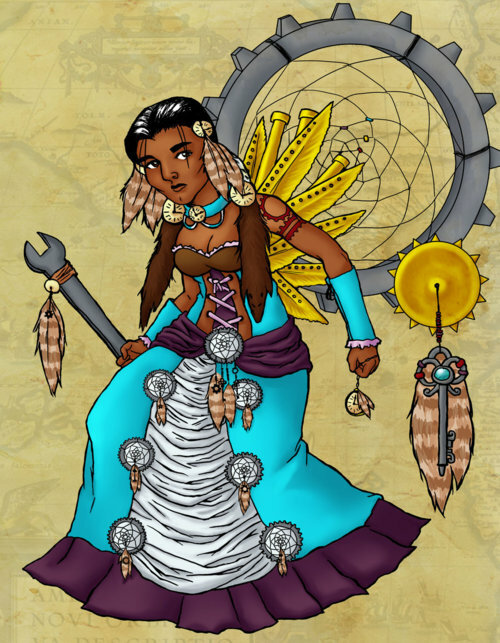 One of the most disheartening aspects I’ve found in American Steampunk alternate histories is the assumption that despite alternate histories that allow for magitek and phlebotinum and aether-powered airships and steam-powered, clockwork everything from cell phones to teleporters to ray guns… there is still an assumption that NDN genocide took place. That European contact can only have occurred in the 15th century and that it can only have resulted in colonialism, slavery, resource theft, land theft, and genocide. A functional alternate history that has the kind of tech seen in steampunk can’t have just started one day in the 19th century. If you’re going to alter your universe, why stick with our existent timeline right up to the last second? What if NDN folks had, say, knowledge of vaccination? Or what if we’d had a greater number of domesticable animals and thus developed a wider profile of immunities to the kinds of communicable diseases common to Europeans? What if we’d developed advanced cross-national communications systems for the sharing of technological breakthroughs before European contact happened? Native Science understands that nature is technology – a compost pile is a massively-tested super-applicable multifaceted waste management system resulting from four billion years of research and development where you put food waste in and get high-yield fertilizer out and the whole process is carbon neutral! I imagine a Steampunk North America (Turtle Island) in which the buffalo population wasn’t deliberately eradicated for genocidal purposes and which thus still enjoys the resources of vast areas of tall grass prairie (you need buffalo to have prairie as much as you need prairie to have buffalo because many seeds will not germinate correctly or thrive without passing through a buffalo’s digestive system unless human intervention is applied). I imagine a Turtle Island in which deforestation is severely curtailed and vast areas of old-growth forest are deliberatly maintained. I imagine city architecture utilizing rammed-earth walls and green roofs on large communal buildings, and time-tested local building technologies on smaller, private residences. I imagine populous cities designed for walkability and communal pedestrian culture. I imagine a North America in which the Black Hills are not defaced with gigantic carved graffiti of doofy white dudes. PreviousMoving On The Wires: My First Blog Nomination!